Fabricated from exquisite Crema limestone from Mexico, the Villa Laguna is a limestone kitchen hood that holds its own as the main attraction in many kitchens. With meticulous detailing and a stunning presence, this kitchen hood is a perfect representation of the Gothic Revival style. 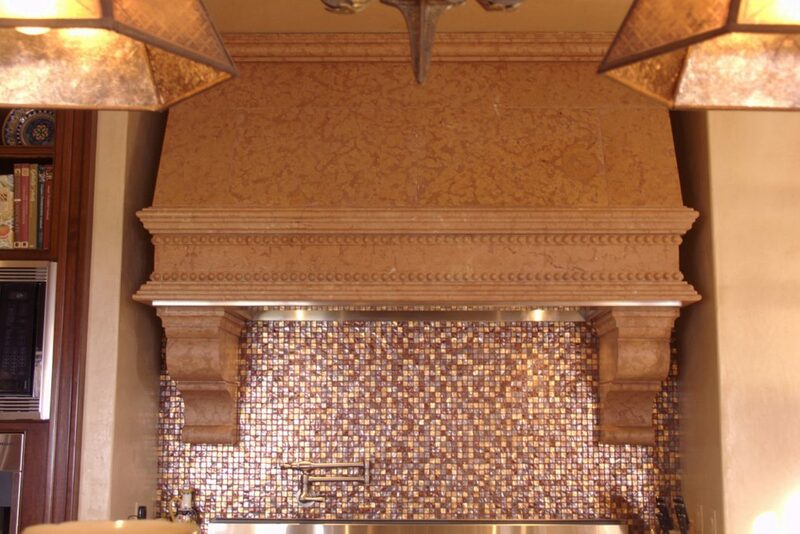 This particular kitchen hood was created by our artists and now graces a home in Isleworth, Florida. 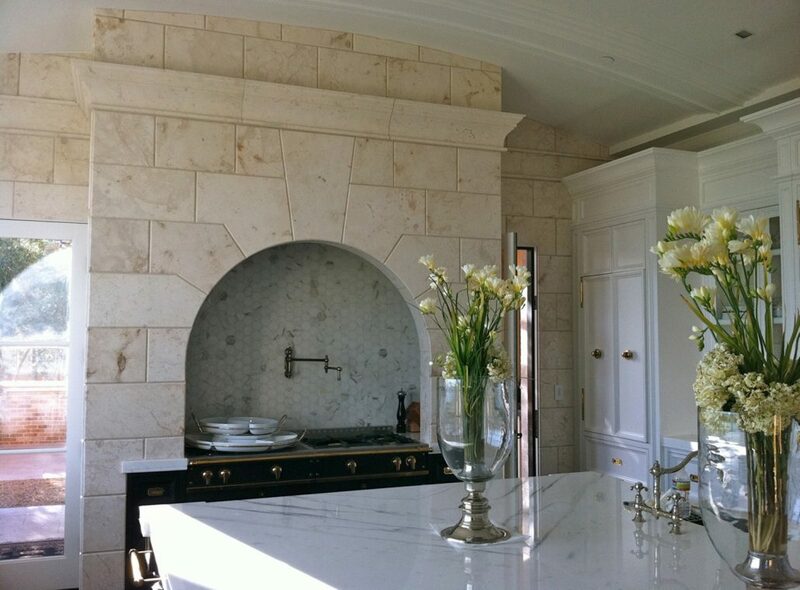 The Villa Melograno is a gorgeous traditional stone kitchen hood made from Crema limestone, which originates in Mexico. The Villa Melograno represents the Traditional Country style, making it ideal for use in a wide variety of kitchen builds. 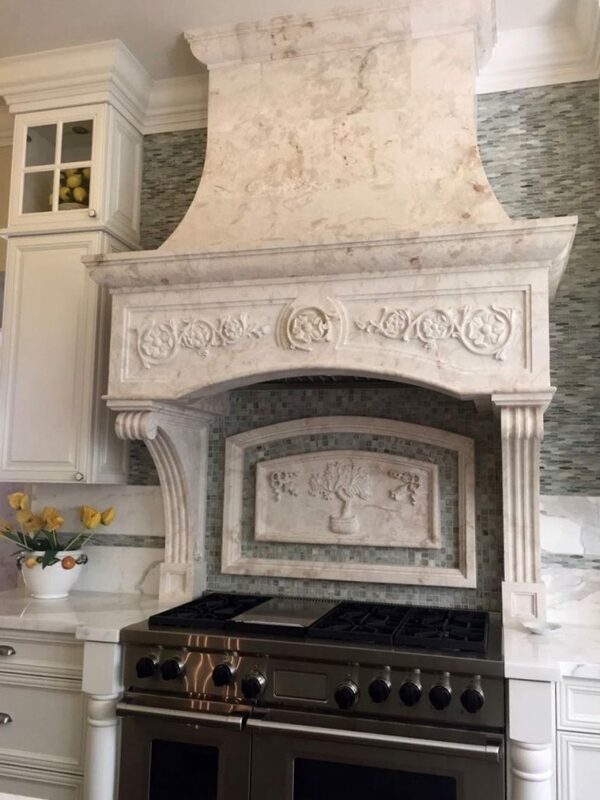 This particular limestone kitchen hood is currently gracing a beautiful home in Newport Beach, California. The Rambert is one of our most popular stone kitchen hoods, and is fashioned from Beaumaniere limestone. Originating in the countryside of France, this kitchen hood is a spectacular representation of the English Country Classical style. The kitchen mantle pictured here currently is located in a Strands Beach, California home. 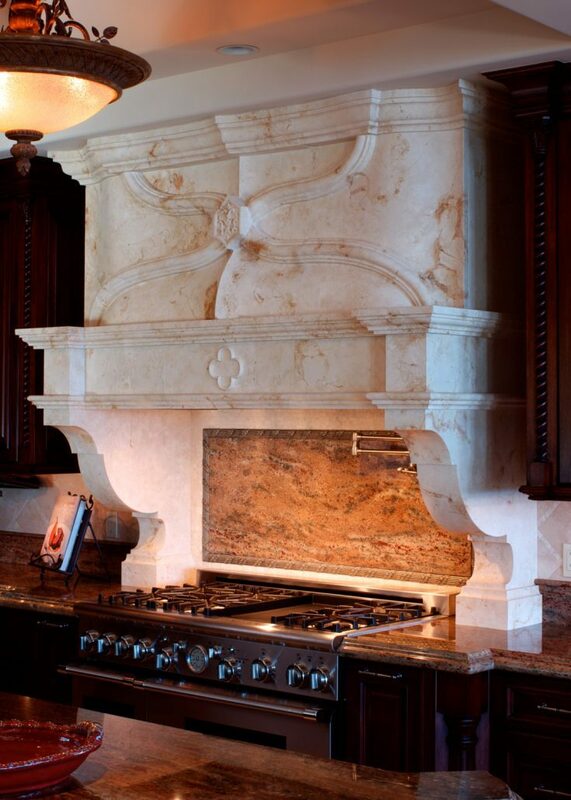 The Riviera is an incredible example of a stone kitchen hood in the Classical Italianate style. Made of beautiful Rojo Verona marble, the Riviera is made of stone that originates in Italy. The kitchen hood pictured here in this style is currently gracing a fantastic kitchen in Newport Beach, California. Another fine example of the elegance that stone kitchen hoods behold is The Goelman. 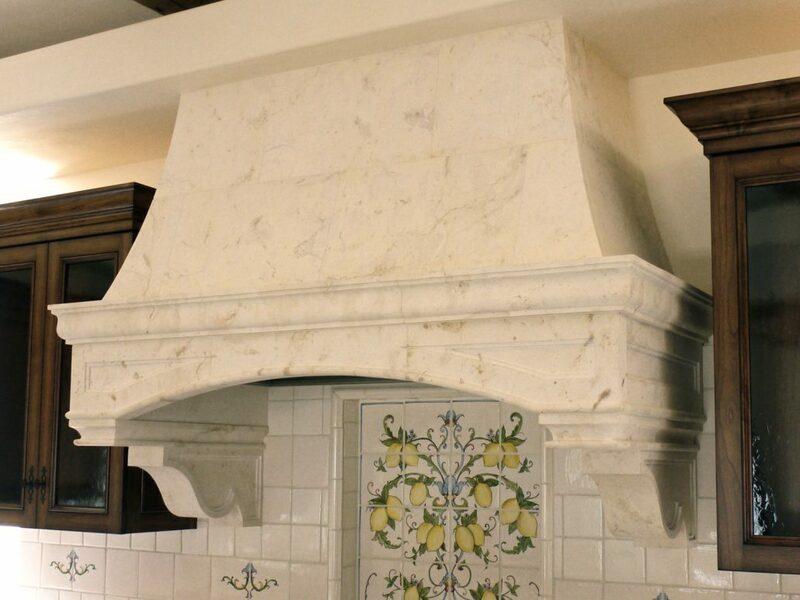 This limestone hood is made of Crema limestone – a stone that originates in Mexico. 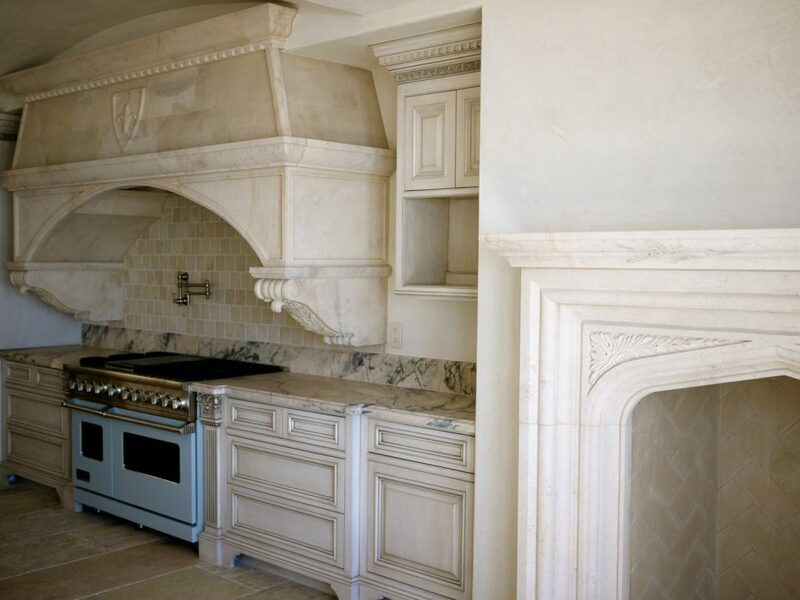 The Goelman is an exceptional display of the Classical Contemporary style, and the pictured kitchen hood can be found in Cameo Shores, California. If your heart is set on a limestone kitchen hood in the French Provincial style, the Townsend may be exactly what you’ve been searching for. This one is created from marvelous Crema limestone that originates in Mexico, and is graced with exceptional carved detail. The kitchen hood pictured here is holding its place in a home in Boca Raton, Florida. We invite you to work alongside our craftsmen and our designers for your next remodeling project. Whether you know exactly which stone kitchen hood you’ll want or you have no idea yet, we’ll be there to help you every step of the way. We can use your own design, and we also invite you to explore our library of designs. BT Architectural Stone would be honored to breathe new life into your kitchen with a custom stone kitchen hood. Contact us today to learn more.